We were lucky enough to sit down at the UK offices of R.M. 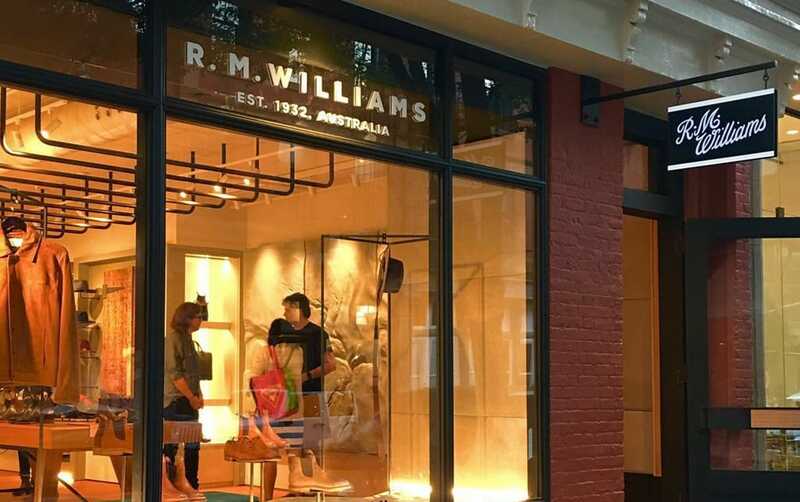 Williams, the prestigious Australian shoe brand. Jo (European Wholesale Manager) and Sandra (European Wholesale Sales and Customer Service Executive) welcomed us with open arms and let us pick their brains about their boots! Let’s start out easy! Can you describe R.M. Williams in five words? We tried to think of some and we thought of timeless! S: Yes, timeless is a good one! What is the main inspiration and vision of the brand? S: I think the vision still continues to be giving people comfortable footwear, that’s where [R.M.] started it from. Comfort with style. J: [Jo read out one of the product tags with the vision] Purposefully designed clothing that passes the Outback test. The ethos around the brand today is ‘rugged elegance’. That’s funny because didn’t Dollar Mick rock up without any shoes and R.M. didn’t think he could be professional without shoes? J: Yes that’s right! In fact, I actually found a photocopy of them meeting Queen Elizabeth. It was in our old office and was completely battered so we got it touched up, but R.M. and Dollar Mick met the Queen! Look at [R.M.’s] hands, that’s a workman’s hands! And now, we actually fit out the entire Australian Army with [the Comfort Craftsman in black] for their parades. S: Yeah, it’s definitely not just for your fashiony boys, they are purposefully built shoes. Who would you say your direct customer is then? J: City to the bush, it differs. In the bush, there is one type of customer and then the city, we call them the boot-boy. That’s your James Bay, skinny jeans and fashion conscious, which is like our new Soho store. The other side, someone who understands craftsmanship and quality, with the traditional customer it’s about the quality and heritage. You have some big celebrity investors and customers, like Hugh Jackman who invested in 2015! J: I know [Jackman] shops in our New York store. S: Yeah, he got involved and invested to ensure the Australian brand keeps going. You’ve also got Glenn McGrath, the Australian sportsman. He is part of the business as well, not so much [in the UK] but in Australia, he will go out and talk about the brand. J: We like people who choose to wear our shoes rather than paid endorsements, so we know they love it. I suppose it’s more organic, so your products sell themselves. J: We have lots of photos of Daniel Craig in our boots. S: He buys in our Bond Street store and now also in the New York Store. J: Oh and Cillian Murphy! S: He’s been buying R.M.’s for years. J: We actually had a call recently, [Cillian Murphy] was in a film and we had to supply his stunt double with our boots because Cillian was so insistent on him wearing them. S: You also have people like Joe Ottaway, he’s always got them on. Other people, like Niall Horan from One Direction he wears our boots, and Liam! Again, they’ve come to the brand themselves. So, you must have seen an influx of sales to the younger audience because of celebrities and social media? S: Yes. Massively. It’s all about that social posting. J: Especially in our Bond Street store which is currently getting refurbished. It’s all going to be stripped back and should help bring in a younger customer. Is there anybody personally you’d love to see wearing R.M.’s? S: I’d like to see Jack Savoretti in our boots. He’s so good-looking! J: We did make some boots for Lady Gaga. S: Yeah, they were pink! I bet they were something else! What kind of pink did she go for? S: Lots! We made loads and she picked, I think she went for a dustier pink. It was to do with her last album. J: Yes! He’s just really classic. Completely agree, so how do you keep authentic to the brand while still evolving as a company? J: We just base everything on the original style, the Craftsman which is our bestseller. We bring in new leather and new techniques. S: Knowing where it started from, we still to this day make the boots how [R.M.] wanted them to be made. J: When there was the takeover of the company, there were a lot of changes but you have to accept it and evolve. S: The burnishing [technique] really made a difference, we had someone come over from Italy to train the team, which was exciting as the guys now have another element to add to their trade. J: We never sold as many boots in the UK as last year, I think it was because we have new leather and new techniques. J: When there was the takeover of the company, there were a lot of changes but you have to accept them and evolve. S: -New stores, new options. It’s the expansion of [the brand]. With LVMH [Moët Hennessy Louis Vuitton] taking over R.M. Williams in 2014, does R.M.’s family still have any connections with the company? J: His son has a store in Australia, he’s a stockist, but there is nobody really connected with the brand. S: That’s why his best friend took it over originally, there was nobody in his family that wanted to be a part of it. What would you say is your absolute favourite R.M. product? S: Yeah, I would have to say the same. J: I don’t have it on today, but it’s 15 years old and it’s so soft and looks brand new. S: I think it’s also because we have the connection of watching the girl make them. It’s unbelievable to see the trickery of it! We know you crafted a pair of boots for Patrick Swayze and the team wrote love notes and marriage proposals in the lining, do you know if he knew about them before he died? S: Ooh, we don’t know, but we will have to find out! J: We do give a pair of boots to each US President though, they are called The President Boot. S: Obama definitely had a pair of boots, I don’t know if Trump has been presented with a pair yet, but he will. Are there any other favourite memories you have? J: Russell Crowe had just finished filming Gladiator and came into our Regent Street store and took down a stock whip. He went down a side street and stood there on a Saturday afternoon and started cracking this whip. S: How he didn’t get arrested I don’t know! J: It was so loud but he was having so much fun! That’s brilliant! What’s the weirdest way you’ve seen your boots being styled? J: -Oh is this the graveyard one? S: No! They had the boots on and, I suppose, deer hornheads. That’s how they styled them, and it was a seven-page spread! R.M. would have turned in his grave! J: I was thinking of this pale boy who looked deathly ill, his shirt was open, and he was lying across a gravestone. He had super tight trousers on and our cowboy boots! Asides from the sun, does the family atmosphere of the brand transfer over to the UK? S: I think what you have in Australia are a lot of families, who will have the grandfather in R.M.s, then the father and now the son. It’s generational. We haven’t got there yet [in the UK], I think it will do. J: Yeah, father and son here, but that’s more in the country market. [In Australia] you get a lot of fathers taking their sons in store to get their first pair of R.M.’s, often it’s a 21st birthday tradition. Aside from Australia, which country has the biggest demand? S: [The UK] is the second biggest market. J: Sweden is a big contender too, very clean styling, the boot-boy types. We also have three stores in the US. One in LA, Austin and New York so it’s growing out there too. So finally, we’ve worked with you for many years, why do you think Robert Goddard works so well with R.M. Williams? J: I think it’s really good since [Oliver Tookman] took over [Robert Goddard] with fresh new ideas and moving the company forward. Also, the mix of customers you have is similar to our traditional customer and the more stylish guy. S: You have people who understand our brand and that’s helped when we have been going through turbulent times, you’ve stuck with us. We are in contact with you quite a lot, which helps a brand and the stockist stay together. Every brand goes through up and downs and it’s knowing you have a good stockist who believes in you. Taken from the first issue of The Robert Goddard Style Insider.